^ 1.0 1.1 1.2 1.3 1.4 1.5 1.6 1.7 1.8 Joint Typhoon Warning Center. Super Typhoon (TY) 25W (Higos) (PDF). United States Navy. [2012-08-31]. ^ 香港熱帶氣旋追擊站. HKCOC熱帶氣旋字典——風字：風切變. [2015年8月18日] （中文（香港）‎）. ^ 3.0 3.1 3.2 3.3 3.4 3.5 3.6 3.7 3.8 Gary Padgett. Monthly Global Tropical Cyclone Summary September 2002. 2002 [2012-09-07]. 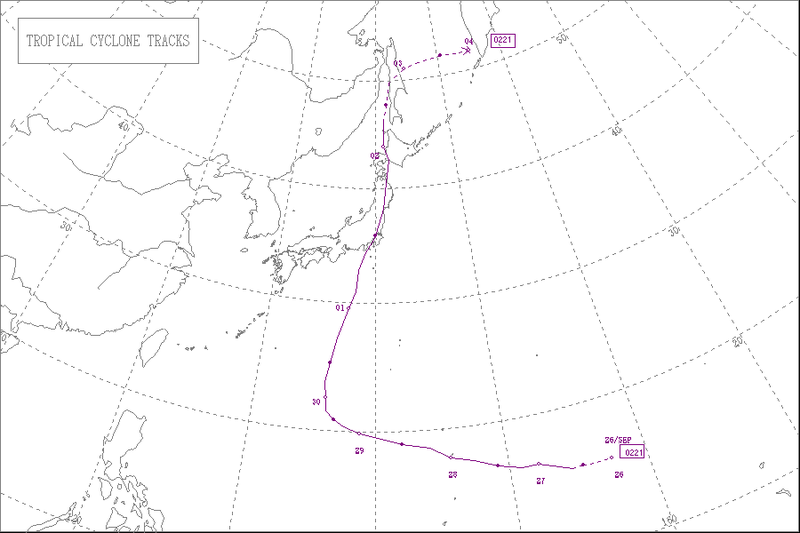 ^ 4.0 4.1 4.2 4.3 4.4 4.5 4.6 Annual Report on Activities of the RSMC Tokyo – Typhoon Center 2002 (PDF). Japan Meteorological Agency. 31. [2012-08-27]. ^ Food Supplies Run Out. Saipan Tribune. 2002-10-01 [2012-09-07]. （原始内容存档于2013-02-08）. ^ Aid Is On Its Way. Saipan Tribune. 2002-10-02 [2012-09-07]. （原始内容存档于2013-02-08）. ^ 16.0 16.1 16.2 16.3 16.4 16.5 Typhoon 200221 (Higos) – Disaster Information. Digital Typhoon. [2012-09-07]. ^ 18.0 18.1 18.2 18.3 Guy Carpenter. Tropical Cyclone Review 2002 (PDF). Marsh & McLennan Companies: 21. 2003-01-30 [2012-07-25]. （原始内容 (PDF)存档于2012-05-26）.